Small and medium-sized business networks are being attacked daily. And when data is held hostage or stolen there are expensive consequences. Many business owners have no idea about the fines and insurance gaps that exist surrounding IT security breaches. Today, it’s essential to have an IT Security Plan in place no matter how large or small your organization is. On Call Computer Solutions can establish and implement a strict security protocol to meet industry and government regulations. Small and medium-sized business networks are being attacked daily. When data is held hostage or stolen there are expensive consequences. Many business owners have no idea about the fines and insurance gaps that exist surrounding IT security breaches. Today, it’s essential to have an IT Security Plan in place no matter how large or small your organization is. On Call Computer Solutions can establish and implement a strict security protocol to meet industry and government regulations. The first thing we’ll do is perform a vulnerability assessment to determine if there are any gaps in your IT security posture. Once complete, we’ll deploy a robust monitoring and maintenance solution that protects your technology and digital information. We provide this for all our IT Managed Services clients, and for a very affordable monthly fee. You’ll have the comprehensive protection you need with remote monitoring. We can oversee your network 24/7, without disrupting or interfering with your operations. And, if you must comply with regulatory standards like HIPAA, PCI, FINRA/NASD, SEC, C/SOX and others, we’ll work to ensure you do. Our IT Security Experts will see that you keep in line with industry guidelines and legislative mandates. They work with highly-regulated industries every day. We don’t use a cookie-cutter approach. We custom-design your protection to align with your operations. 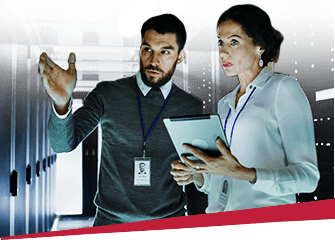 You’ll benefit from an enterprise-based IT security solution that includes a multi-layered, defense-in-depth structure with intrusion protection, along with up-to-date patching and maintenance on an ongoing basis. All the while, you can concentrate on your work because we do this quietly behind the scenes. If we do detect an intrusive attempt, we’ll notify you. Plus, we’ll provide monthly reports to assure you that your IT security is intact. A firewall is a front-line defense against web links that harbor malicious code. Our Managed Firewall provides strong security while optimizing your internet performance. It also makes your networked computers invisible to hackers. Our experts will define your security policies and configure, manage, and maintain your firewall. With it, they’ll monitor and block links that contain malware and other viruses. With this advanced monitoring and reporting, you can comply with security and regulatory requirements. Our WiFi Security gives you a password-protected, encrypted, high-performing wireless solution. It prevents tampering and unauthorized access while allowing your employees to access the files they need. Wireless security also defends your network against malicious attempts like man-in-the-middle and denial-of-service attacks. Even if your wireless network is compromised, the intruder won’t be able to view the content of your data in transit. Our detection and prevention system will alert us (and you) if a security breach is attempted. If your business is like most, your staff transfers files and information via email. But what would happen if these messages fell into the wrong hands? Could they be used to harm your business or your clients? Unfortunately, email security is often overlooked. But, with all the phishing emails and spam circulating today, it only takes one click from an employee, and your data is breached. Our Email Security Solution encrypts and authenticates all of your email messages to prevent them from being read by unauthorized recipients. It hides the email content from hackers and eavesdroppers by encrypting it into an unreadable form. Ransomware and encryption attacks aren’t slowing down. Yet, many business owners don’t know about the need to inspect SSL and TSL traffic with solutions that use deep packet inspection. Deep packet inspection (DPI) is a type of filtering that we use to inspect data packets that are sent from one computer to another over a network. This is a very sophisticated form of packet filtering that works at the application layer. Our IT Security Experts will hunt down, identify, categorize, and reroute or block harmful data packets that contain malicious code. It’s an efficient, cost-effective method to protect your IT assets and a must-have defense tactic. They keep intruders out. They even shut out the extremely dangerous backdoor parasites and remove them from your system. Backdoors degrade your internet connection speed and system performance. They hide in your files and prevent you from removing them, and there are no uninstall features to delete them. But, we know how to find and remove them, and we can monitor your system so they can’t get in again. They build impenetrable defenses around your IT assets. They’ll ensure you’re using the right anti-virus, anti-spam, and firewall protections. They can deploy VPNs (virtual private networks) and antivirus technologies so your network and endpoints are protected from attacks. They can also encrypt your hard drives. They will train your employees. Security Awareness Training for your employees will teach them how to defend against risks, detect phishing threats, and use passwords correctly. This is the best way to ensure your staff knows what to do to keep from falling victim to attacks and prevent exposure of your confidential information. With assistance from the Security & Compliance Experts at On Call Computer Solutions, you’ll boost your defense posture and decrease the likelihood that an intrusion or data breach will harm your organization.